Adampur, April 29: Countdown of Hooda government has begun and after the announcement of byelectionresults on 25 May, the anti people Congress government would be out, said Indian National Lok Dal (INLD)leader, Mr Abhay Singh Chautala, while addressing a election meeting at village Patherra(Indri) in favourof INLD candidate, Dr Ashok Kashyap.Mr Chautala also addressed the election meetings at Nandi, Kalri Jagir, Dhanaura & Khera villages of Indri Constituency. INLD former state president, Mr Sher Singh Barshami, INLD MLA Mr Balwant Singh Sadhaura,former Haryana State Service Selection Commission chairman, Mr Amir Chawla were also present in themeetings.Taking dig at the Congress party for allocating party tickets to the defectors in the three byelections, Mr Chautala said that Congress party does not find anyCongress workers in the state so it has given tickets to the party defectors. He said that all the government functionaries have realized that the sweepof Congress party from the power is imminent so they were indulged in open loot.Launching a severe attack on Congress party, Mr Chautala said it has failed to fulfill even a single election promise and the people of the state wouldsettle score by defeating all the congress candidates.He said that the people of the state are suffering due to the insufficiency and scarcity of electricity &water. He said that the people are terrified due to deteriorating law & order situation in the state. No body is feeling safe in the state as all the Congressleaders were involved in looting the state to fill up their coffers and they have no time for the people, he added. market forced the government to start the process. Goods train reached Gohana and the process to lift the wheat started today. Yesterday, he had asked the concerned authorities to lift the grain with in next 48 hours. Gohana assembly. INLD Secretary general , Mr Ajay Singh Chautala and INLD candidate from Adampur, Prof Sampat Singh addressed election meetings in 19 villages today including village Tokas, Patan, Aryanagar, Ludaas, Shahpur etc. INLD leaders asked the people to support INLD as this win would start a new chapter in the political history of the state. Mr Chautala and INLD candidate Prof Sampat Singh were given rousing welcome in all the villages of Adampur constituency. 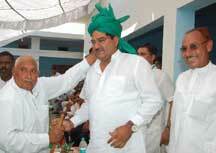 Villagers promised to provide full support to the INLD. Many Congress and HJC workers also announced to join INLD during the meetings.